I remember a few years back when all the location-based services, like Foursquare, didn’t have a complete set of locations to check-into. I would often find myself creating a new location or skipping the check-in altogether. Starting today, you’ll start seeing updates…from the places where you’re a loyal customer. It’s an easy way to keep up with news from places you frequent, including things like new specials, pictures of the latest shipment of shoes, or a serendipitous food truck appearance. The best part is there’s no extra work for you to do: we already know you care about a place if you’ve checked in often or liked it, and will show you updates from it when you’re in the same city. Also, when you look for places or when you check in, you’ll see these updates on the page – kind of like the chalkboard where a restaurant writes its daily specials. For example, when you’re on Northern Spy Food Co.’s page, you’ll see their recent update about their latest seasonal drink. To see what these look like in action, check out some of the businesses that have started sharing updates. Some are national chains, like H&M, Togo’s Sandwiches, Outback Steakhouse, and Wolfgang Puck. Some are universities on foursquare, like University of Wisconsin-Madison, University of South Florida, Duke University, Texas A&M University, Indiana University-Bloomington, and Boston University. And some are local New York favorites, like Luke’s Lobster, New York Public Library, NYC Parks Department, and Northern Spy Food Company. Source: Foursquare Blog – Introducing Local Updates from businesses – keeping up with the places you love has never been easier! It’s official, all the social networking sites have started adding “promoted” tweets/posts/places to your news feed. It’s no surprise considering that Twitter, with its “promoted tweets,” recently said it has a “truckload of money in the bank”. Today Foursquare is launching its version of search ads, Promoted Updates. Promoted Updates operate like Google’s promoted listings or Twitter’s promoted tweets. They are pay-per-action ad placements that only appear when a user is searching for a venue in Foursquare’s Explore tab. Foursquare determines a user’s current location and check-in history before displaying a Promoted Update. The ads are powered by the same recommendation engine as its Explore feature. All of the paid placements will be clearly labeled at the top of the feed; they can include a store’s recent news, photos or specials. Foursquare has partnered with about 20 merchants, from small mom and pop shops to national chains like Best Buy, to launch the pilot program. In the next few months, Foursquare hopes to turn Promoted Updates into a self-service tool merchants of all sizes can use on its platform. If you use foursquare to check-in to your favorite locations and share those notifications on Facebook, then you’re in for a treat. 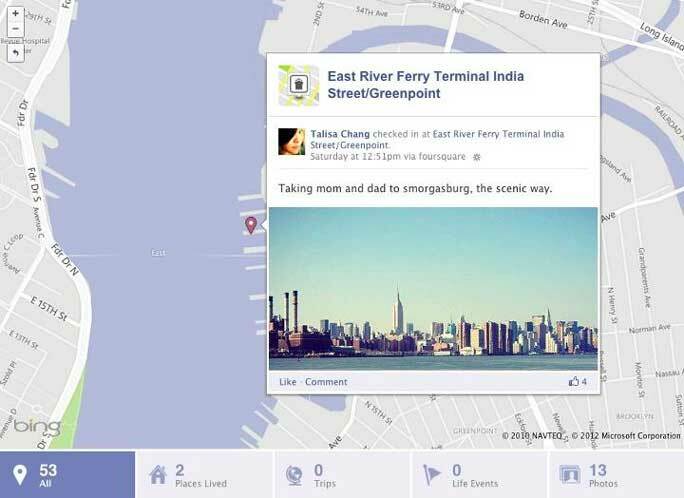 Foursquare has announced that your foursquare check-ins will now populate your Timeline map. 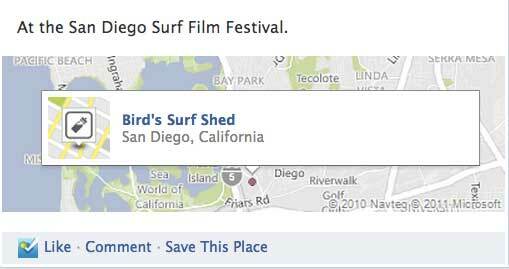 Before, only actual Facebook check-ins as well as location tagged images would populate that map. This is a pretty nifty update. When you visit someone’s map on their Timeline, you can see pins of all of the places that they’ve been without you having to dig through their actual profile to find location-style updates. Adding foursquare check-ins will certainly make this a more enjoyable experience. If you’re wondering about all your past check-ins, I only show about two months worth of history on my Facebook map. This could mean that only the check-ins since Foursquare integrated with Facebook Timeline are included. Now, when you see a friend’s foursquare check-in on Facebook and want to try that place too, you can click the new ‘Save this Place’ link and save it to your foursquare to-do list for later. All it takes is one click, and you can do it right from Facebook (the save will appear on your Timeline, too, just like other apps you’ve connected to Facebook). It’s an easy way to get ideas for future outings, and foursquare can do the work remembering them. Three months after the acquisition of Gowalla by Facebook, the company has officially closed it doors. The screenshot below can be found on the location startup turned travel guide‘s homepage. Gowalla launched in 2009 and raised approximately $10 million. Facebook’s acquisition price hasn’t been disclosed but is rumored to be primarily Facebook stock. Early investor Jason Calacanis talks about the end of Gowalla. In October 2011, Google finally revealed pricing for Google Maps services. Lightweight usage was still free…significant load volumes would begin to incur charges: basically, services and applications that generated more 25,000 map loads per day would be charged $10-$40 for every additional 1,000 map loads. For businesses put off by the new costs of Google Maps, the main alternative seems to be OpenStreetMap. OpenStreetMap is a UK-based, volunteer-driven non-profit dedicated to creating and offering free geographic data to anyone who wants it. 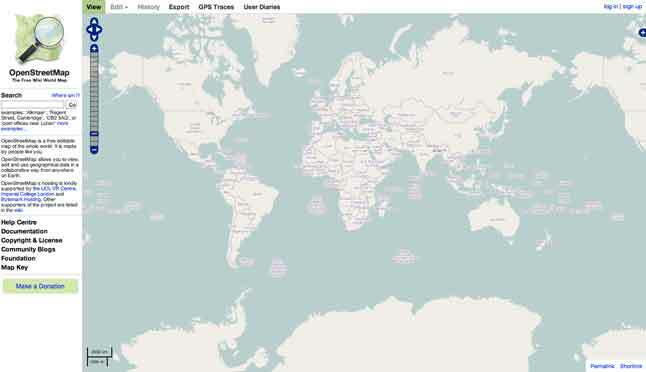 OpenStreetMap (or OSM) boasts more than 400,000 registered volunteers who supply mapping data and updates to the project. It’s an oversimplification, but think of OSM as a loose equivalent to Wikipedia for mapping data: anyone can contribute, and the content is available to anyone. Foursquare and Apple have already made the leap to OSM – learn more – Why Are Companies Defecting Google Maps? Art and icons of Foursquare…can you decipher the meaning? These icons are from the lead designer at Foursquare. The gray ones are meant to identify locations and the color ones are badges meant to reward you for something. Can you identify the location and/or reward for each one? Continue reading Art and icons of Foursquare…can you decipher the meaning? Posted on January 6, 2012 Author robotchampionCategories defaultTags art, decipher, design, Foursquare, graphics, icon, lead, mari sheibley, meaningLeave a comment on Art and icons of Foursquare…can you decipher the meaning? For all the folks wondering if Foursquare has jumped the shark, and more specifically, what’s the point? — the point is Foursquare is about to become the shark, at least in the blue ocean of mobile, location-based social networking. The answer seemed to come earlier this year with the rollout of Foursquare 3.0 and its partnership with American Express. It’s axiomatic to say that in the world of social media, if you’re not paying for the meal, you are the meal. I’m okay with that, as long as I get fed too, which the service has started to do thanks in part to the American Express ‘Sync and Save’ program — sync your Foursquare account to your Amex account, check-in to your favorite spot offering a deal, and see the credit on your Amex account. I’ve already unlocked two specials. The initiative is part of the company’s philosophy to “make every check-in count” — so regardless of whether you’re checking into the same ol’ coffee shop or some far-away beach, Foursquare is aiming to add value, every time, for every user. A great example of this is near-by Specials, which are growing more attractive, more relative, and more robust every day. And in making every check-in count for users, Foursquare is making every check-in count for companies looking to market their services to users. In the case of American Express, the credit card company is aiming to appeal to a more hip, technologically-savvy, a.k.a younger crowd. I don’t know how relevant Foursquare will make Amex to the ‘under 35’ demographic, especially as other credit card companies jump in. What I can actually see happening is the specials and savings attracting an older demographic, with someone like my mom using the app, thus making the service more mainstream. Regardless of age demographics, the real marrow of the platform comes in the form of its user data. I can only imagine how savory it must look to companies aiming to market their products and services. American Express admitted the partnership has already brought a higher response rate than anything else they’ve done. With over 15 million users worldwide and 80+ employees, Foursquare is en route to become the Amazon of the online, on-location user experience. As they continue to develop their suggestion-based algorithms, strengthen loyalty programs and add more value in the forms of discounts and specials, I think they can maintain their postion over imitators like Facebook, who just acquired Gowalla, and Yelp, who rolled out their check-in offers program last month, by making every check-in count.